Eshasoft Desktop Calendar Software is a user-friendly and fun to use all-in-one productivity tool. With Eshasoft All-In-One Desktop Calendar Software, you can easily organize your time and contacts, and browse the Web with no pop-ups. Desktop calendar software will help you manage appointments, to-do lists, schedules, and more. ...... It allows you to view all your events in a daily, weekly or monthly overview. You can also print your calendar in day, week or month view. Desktop Calendar Reminder is simple, compact and easy to use desktop calendar. Customizable PIM on your desktop wallpaper. 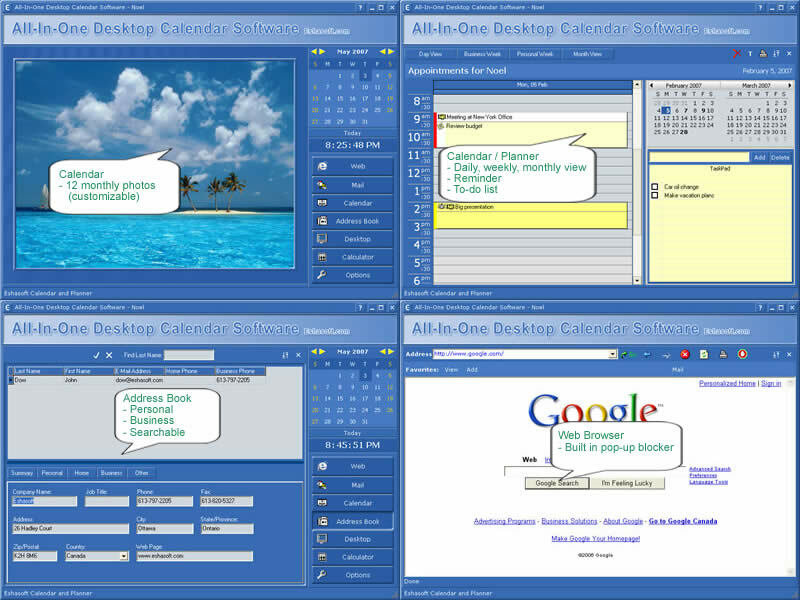 Qweas is providing links to All-In-One Desktop Calendar Software 2011.0.0.1 as a courtesy, and makes no representations regarding All-In-One Desktop Calendar Software or any other applications or any information related thereto. Any questions, complaints or claims regarding this application All-In-One Desktop Calendar Software 2011.0.0.1 must be directed to the appropriate software vendor. You may click the publisher link of All-In-One Desktop Calendar Software on the top of this page to get more details about the vendor.